Pyramidal are a new spacerock band that hail from Alicante, Spain. And when I say spacerock, I mean SPACEROCK! These guys have it all, from the cosmic synths to the crunching guitar riffs to the touches of Middle Eastern modes. This is, indeed, spacerock in the purest sense. Mostly instrumental, there are only one or two tracks that have vocals, and those are very low in the mix. These guys are all about the music. Opening cut, Intronauts is a short piece of spacey electronics with something that sounds like an exotic fairground in the distant background. It leads right into the heavy duty, 9-minute rocker, Black Land. This stuff reminds me of the brain pummelling tyranny of bands like Void Generator. In fact, Void Generator is not a bad comparison, but throw in a few more of those cosmic electronic space sounds for good effect. Kosmic Blizzard is maybe even a little heavier than Black Land, and has some bluesy and Middle Easterny riffing going on in it. The title track continues the heavy riffing, but this time slows down in the middle of its 8 1/2-minute length for some spaced out guitar noodling before returning to the monster riffs. But it’s a sign of things to come. What follows are the three longest tracks on the album. 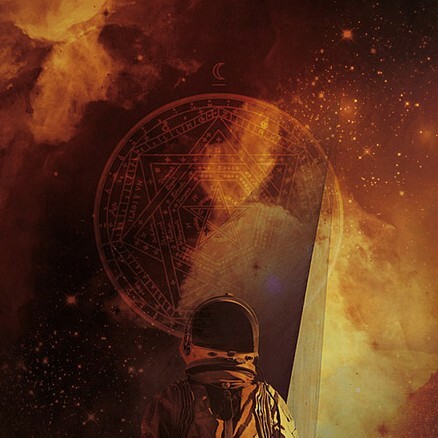 The 10 1/2-minute Plastikleuten Parts 1 & 2 begins with a menacing low-key riff and some tribalesque drumming that slowly builds into the scorching rock of the second half… but even this takes an abrupt turn at 7 1/2-minutes in into a mesmerizing deep space exploration with layers of interstellar synth and freaky effects. The 11-minute Tempel Iraru is the most Middle Eastern influenced track on the album, and perhaps the trippiest too, beginning with a somewhat mellower excursion into exotic guitar and space wind synths before kicking into another riffing rocker, with mystery monk chanting between the furious guitar solos. It even eventually showcases a lengthy drum solo (!) that whips the track up to its ferocious climax. Mars Lagoon on the other hand, is a nifty bit of space funk with a Latin vibe to it, like something off Santana’s Caravanserai album, but with a trippier overall feel to it. At any rate, it’s got a great groove. It’s ostensibly the longest track on the album, clocking in at 14 1/2-minutes, but it’s interrupted in the middle, at about the 8-minute mark, by a perplexing 90 seconds of silence, before launching into a tasty Motorik jam with a lighter, distinctly Neu! kind of vibe to it. I think the idea here was to have a kind of hidden track, but it might have worked a little bit better if these two pieces were merged into one to make the final track a tighter 13-minute one. Nonetheless, despite one little misstep, this is still a great slab of true spacerock. It’s nothing overly ground breaking or innovative, but it’s still a solid album that will definitely please fans of the genre.